One of the greatest threats to your ability to succeed in forex trading is your emotions. No forex trader can entirely control worry, fear, and greed – and each of these is liable to lead you into error when you are making a trade. For some traders, the solution is automated forex trading: A computer program that operates your forex trading strategy, or one that is recommended, without being influenced by emotions. It takes into account the elements of a strategy that determine when to trade, how much to place on a given trade, and when to exit, among others. The elements of an automated forex trading strategy can be based on reasonably basic operations, for example, like following a Fibonacci retracement, or they can comprise a complex and sophisticated strategy with many elements. You can choose the strategy you prefer, or let the experts provide one for you, but you must accept the conditions that come with getting a machine to do the job. This means that the strategy will be executed exactly as planned regardless of any change in conditions, the market, etc. There are automated forex trading systems that make use of the programming language on professional platforms like MetaTrader 4 and MetaTrader 5. Others run separately on a computer and connect up to automated forex trading platforms. Some automated forex trading platforms have strategy building ‘wizards’ that permit traders to build a strategy from a list of indicators. This allows a non-specialist to enter in each element of a strategy separately, but then the program will trade according to all the desired criteria – i.e., you input trading entry when a moving average is crossed, or when a given stochastic move to a specific position. It is also possible to work with a forex broker who provides an algorithm that implements a very sophisticated trading strategy – these are sometimes called forex robots. The programmed applications of the forex robot include ways of managing a trade while it is in progress. The robot will place stop losses and profit-taking strategically, insert trailing stops or even implement a scaling strategy. 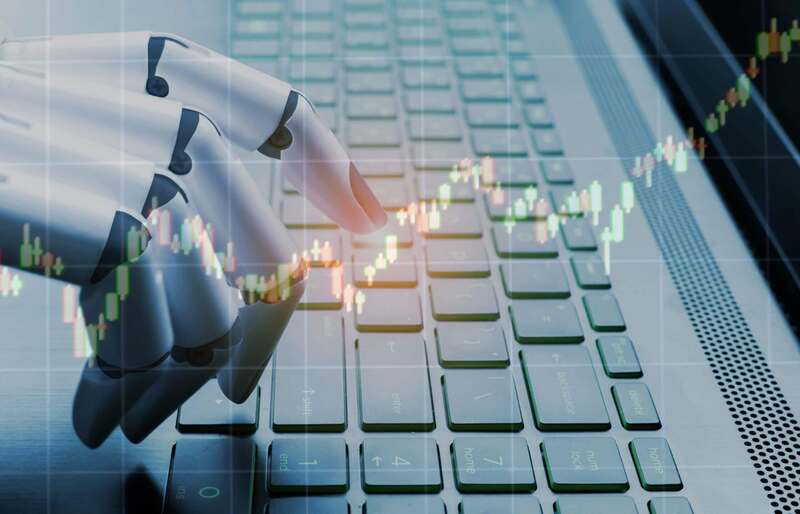 From a mathematical point of view, the robot can do everything to make your trade succeed – unfortunately, trading is not a mathematically determined science, and so success by these robots is limited. This takes the burden of trading off the individual but means that you will only earn as much as the algorithm is capable of. The average return from such algorithms is six to eight percent per month – if you find one that promises more, by all means, test it out! What these programs are very good at is cutting losses – they will keep you from bad trades or trades in which some element of strategy is neglected. There are, of course, some dangers to be aware of in using forex robots. Like all computer applications, forex robots often have bugs that the software maker hasn’t ironed out yet. A bug can undermine the effectiveness of the forex robot, or break it down in the middle of trading. Then, forex robots, like all computer programs, are vulnerable to hackers if they do not operate in an environment of perfect security. Forex trading on a platform is very safe, but when you move it to another computer or data provider, you need to ensure that the correct protection is in place. Then there is a less obvious danger: Limited application to market conditions. You may choose a forex robot for a specific strategy, but the market is always changing, and that strategy may just not apply after a certain period. You can move to a new one, of course, but you should be aware that robots are inflexible and have a limited shelf-life without recalibration. Backtesting is the way to decide if a forex robot will work for you. You input conditions from a specific period in the market in the past – so that you know exactly what the outcome of trades will be – and then you see if the robot follows the logic and makes winning trades. But even with backtesting, it is challenging to tell how well a given robot will succeed in real conditions. Vendors will show you all sorts of records of success, but there’s no way to know if they’re real. The only way to find out is to try the robot out, and see what happens. There’s a great deal of curve-fitting or adjustment in the selling and presentation of forex robots that are ready-made for use. No machine can win all the time in forex trading, nor can any human being succeed 100 percent of the time, no matter how great a genius the trader is. The market is not always rational and is affected by too many factors to always provide happy results. What you want from a forex robot is a reasonably consistent level of success. A human being who is a good forex trader can earn more than these machines on a regular basis. Consider what will work best for you, and what your goals are as a trader, before going the forex robot route.